THE #1 hair style in the natural hair community is hands-down the Puff. This style can be done on short or long hair, and only requires one thing – a ponytail holder or you could also try a puff cuff. Laid edges are optional. 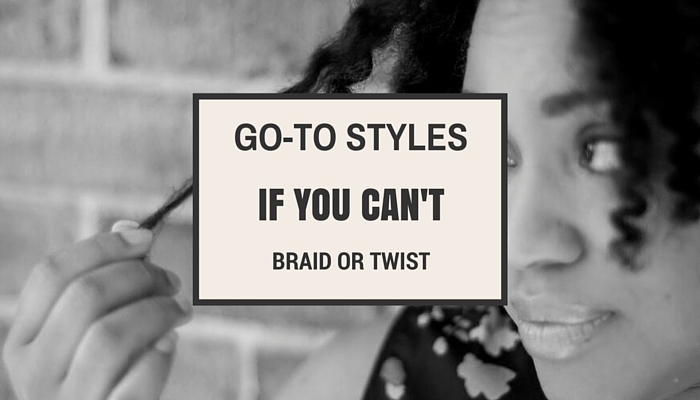 For those days you want to tuck your hair away, or have a major styling fail, this is the go-to style. You can do this tons of different ways, and again, it another style that can be done on various hair lengths. It’s one of those styles that looks like it took a lot of time, but totally doesn’t. Contrary to popular belief, any hair texture or curl pattern can achieve curl definition styles, better known as the wash n go. It can be done on any length of hair, and there are tons of products and techniques you can use. The trick is finding what works for you and your curls. See which products we recommend for wash n go’s here. The bun is one of my favorites, and it’s done very much like the puff. The bun has a more sleek look because it has some structure. You will need more length to create a bun than you do to create the puff. If you don’t have length you can always use marley hair for fullness or use a hair donut. This style is easy and all-purpose: you can wear a high bun, a low bun or even and side bun. For a fun and funky style, the faux-hawk is another style that looks way more complicated than it is. I like to do mini-puffs or mini-buns and merge them together to create the hawk look. Or you can use bobby pins to hold your hair down on the sides, fluff the middle and boom. Party ready! Don’t know how to cornrow? With this hair hack you can easily create the illusion of cornrows, with no knowledge of braiding at all! Did we forget any other options? For those who cannot braid or twist, what are your go to styles?